With the flair of mid-century modern design and the weathered charm of rustic style, the Modern Rustic 7 Piece Dining Set by Intercon Furniture brings a unique look to your home. 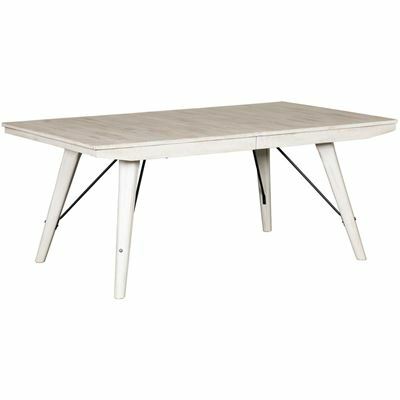 This dining set features mid-century modern’s signature canted, tapered legs paired with a hand-rubbed white paint finish for rustic character. 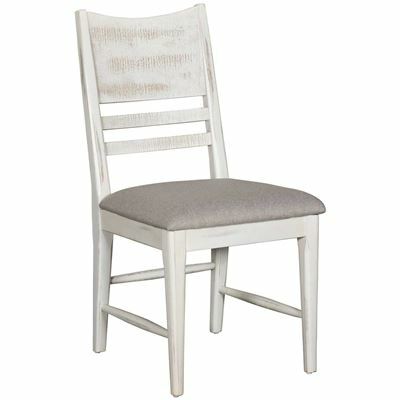 Grey linen-look upholstery on the chair seats adds a modern, tailored touch. With the flair of mid-century modern design and the weathered charm of rustic style, the Modern Rustic 7 Piece Dining Set by Intercon Furniture brings a unique look to your home. Modern Rustic 7 Piece Dining Set by Intercon. Set includes 1 dining table, 6 side chairs. Hand heavy rubbed white paint for an aged look. Table has one 18” self-storing leaf on ball bearing glides. Synthetic linen fabric on chair seats cleans easily with water. Table requires some assembly if not delivered by AFW.